A dead battery on a Galaxy Tab 7-inch isn’t necessarily a reason to replace the device, especially if it is still performing well. Use the following steps to open up your Galaxy tablet, pull out the old battery, and hook up a new one. If you are going to replace the battery on your Samsung Galaxy Tab 7-inch, you will need a few things. The first and most obvious is a battery that will be compatible with your device. Open up the case of your Galaxy Tab. Read this guide to get a better sense of how you can disengage the various clips around the perimeter of the device that hold the case in place. Once you do this, you will be able to easily lift the back cover case off your device and gain access to the battery. Once you have removed the back cover, you will see a large white battery pack held in place by a single Phillips screw. Unscrew the screw and begin lifting the battery pack out of the Galaxy Tab device. Your battery is still connected to the device by the battery connector. The connector is plugged into the device, by red and blue wires, right next to the screw you just removed. Use a durable plastic tool to pry the connector straight up out of the device. Once you have removed your battery, the rest of the process is easy. 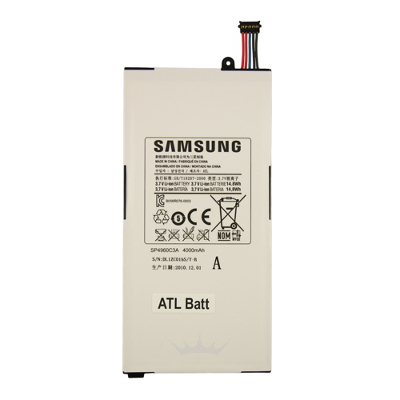 Simply hook your new battery’s connector back into the port from which you just extricated the old battery, put the screw back in, and continue to backtrack through the process to rebuild your 7-inch Samsung Galaxy Tab device! Replace Fire HD 8 tablet SD card with bigger one? Galaxy N10.1 N8010 not charging. Battery and cable already replaced. how can I replace my Yoga 10 B8000-F battery? Is it possible to remove the software of a children's tablet (Leapfrog) and replace it with Android?